The Bulls recorded their first win of the season, and it came against the Elon Phoenix, 34-14. The story of the day was the Arizona State transfer, Blake Barnett and his performance in his USF debut. He looked strong, completing 24 of 34 for 305 yards. Not only did Barnett bomb Elon with three TD passes, but he trucked one in on the ground as well. 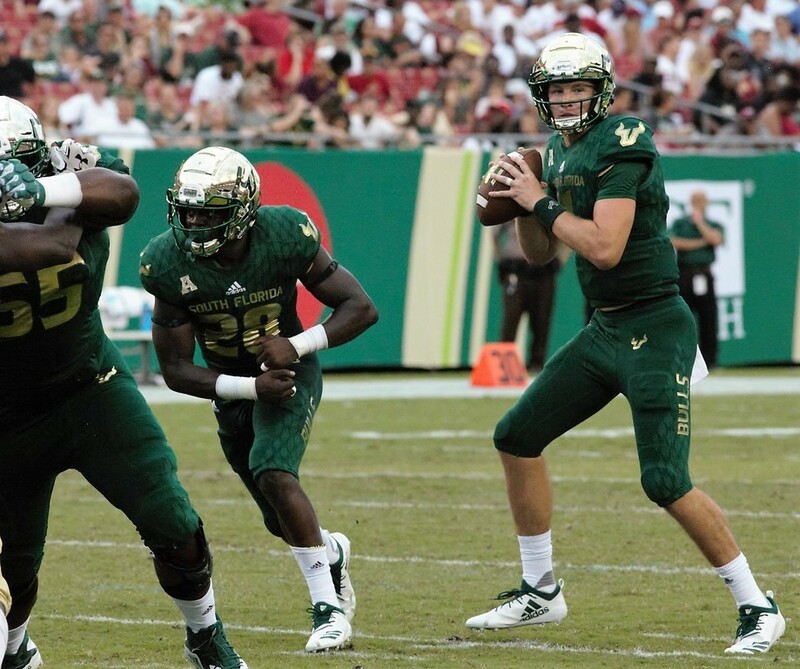 This Saturday, September 8th at 12:00 pm the USF Bulls will host the Georgia Tech Yellow Jackets at Raymond James Stadium. Even though the Bulls are at home, they are coming in as the underdogs to Georgia Tech. With the legalization of sports betting in various states, wagering on college football is becoming more and more popular. If you plan on wagering money on the Bulls or other teams, be sure to check and compare online outlets like Bovada to make sure that you are secure. The Yellow Jackets pounded the ball on the ground against the Alcorn State Braves. Granted, it isn’t saying much considering the defensive front that Georgia Tech was facing, but 439 rushing yards is still something that needs to be noted. Despite a 41-0 win, the Yellow Jackets didn’t look great. Paul Johnson even stated, “I didn’t like how we played, considering who we were playing.” QB, TaQuon Marshall threw a pick in the first half as well as several bad throws. RB, Jordan Mason, gave up the ball with a fumble. And Shawn Davis, the placekicker, booted one directly into the uprights during a routine PAT. The competition wasn’t fierce against the Phoenix, but Elon is tougher than Alcorn State by a longshot. It’s Charlie Strong’s second year, and this could be where things really start to come together under his tenure. A big win against a traditionally more powerful program like GT would go a long way in solidifying a big bowl game for the Bulls. Yes, the Yellow Jackets are the favorites, but many models actually show the Bulls winning this game by a touchdown. Georgia Tech has only won one out of their last five road games and is 3-5 over their last eight games. Meanwhile, USF is 8-2 over their last 10. It’s a team in decline against a team on the rise. Barnett will continue to drop bombs all over the Georgia Tech secondary. Remember, he was recruited under Nick Saben before transferring over to the Sun Devils. He has a great target in Randall St. Felix, and they could hook up for a couple of touchdowns. But the biggest issues for the Yellow Jackets is they have to face the USF defense. Georgia Tech played sloppily against a team that could be beaten by some high school programs. The USF secondary pulled down 15 interceptions last year, and the Alcon State Braves were able to get a pick off GT. If they go to the air, there will be turnovers. So the Yellow Jackets are likely to keep the ball on the ground. They will score, but in a shootout where one team can effectively launch the ball down the field and score quickly against one that has to rely on the run game, the outcome will favor the passing team. USF gets the win in a tough surface and air battle.